The other day, while driving in the Scimitar, I saw what appeared to be a Mercedes-Benz 240D wagon turned into a pickup, and, knowing the Jalop penchant for -aminos, I got a couple photos. Sadly, traffic, right hand drive, and time conspired to keep me from getting better shots, but I think you can at least get the idea. 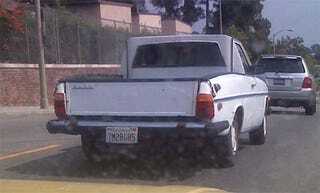 Not a bad job, looks like a decent sheetmetal cab rear-end, and surprisingly, no apparent vestigial back doors. Very good work, Mr. Torchinsky. Jason also adds, "Oh, and no making fun of the huge crack in my dash pad. They can't even get those in England." Fair enough. And we'll be keeping our eyes peeled for a Scimitaramino, the holy grail of ridiculous car blog memes.